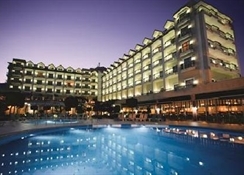 The Palmet Hotel is located in the Turkish resort of Kemer on the Mediterranean coast of Turkey, overlooking the beach. The resort centre with its lively nightlife, shops, bars and restaurants is only 500 metres from the Palmet Hotel. 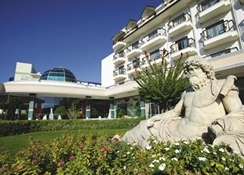 Kemer is a popular resort close to the Taurus Mountains with excellent amenities and plenty of sights to see. The resort has two stunning beaches where you can spend your days topping up your tan or trying your hand at the water sports on offer. For a great family day out there is a dolphinarium with 3 shows a day in the nearby Moonlight Park and there is also a water park close to the hotel.For a spot of relaxation, why not hit the onsite spa and indulge in a sports massage, Thai massage, Turkish bath or a treatment during your stay at the Palmet Hotel in Kemer. There are also excellent conference facilities and regular shows and live music, ensuring that whether you are staying for business or pleasure, you will be well catered for.The Palmet Hotel is great for a relaxing holiday in Turkey or equally for a business trip. With its fantastic facilities and proximity to lots of amenities and activities, it is perfect for everyone â€“ so book today! 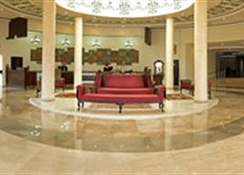 The Palmet Hotel is the right choice for anyone looking for a relaxing and luxurious holiday in Kemer. The hotel has 3 swimming pools, one indoor, one outdoor and one for children. All have bathroom/shower - WC - satellite TV - telephone - air conditioning - WIFI Internet connection - hairdryer - safe - kitchen - fridge - cooker - (certain amenities may be payable locally). The hotel has a main restaurant, a bistro and a snack bar. An open buffet service is available at breakfast, lunch and dinner in the main restaurant and also late breakfasts. Snacks including teatime (cookies, cake assortments etc.) are available at the snack bar and there is a midnight food service at the main restaurant. Drinks are available between 09:30 â€“ 0:30 at the snack bar and lobby bar. Breakfasts are available on the AI programme between 07:30 â€“ 10:00, late breakfasts between 10:00 â€“ 11:00am, lunch between 12:30 â€“ 14:00, snacks between 12:00 â€“ 15:00, teatime is between 17:00 â€“ 17:30, dinner between 19:00 â€“ 21:00 and finally there are midnight snacks between 23:00 â€“ 23:30.